WEG, has enhanced the functionality of the CFW701 frequency inverter for heating, ventilation and air conditioning applications with the addition of a manual/automatic override. 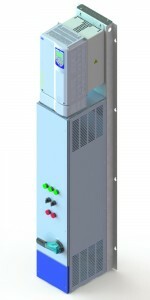 An integrated motor protection switch is said to give the new system, consisting of a cabinet unit fitted with a CFW701 frequency inverter, redundant motor protection for consistently reliable operation. In case of a frequency inverter defect or outage, the output relay of the CFW701 connects the motor directly to the mains through an external bypass circuit.